The Tiger's Wife is one of this year's biggest literary books, and it may be the clinching proof that fantasy has more narrative power than straight-up realism. The book's present-day sections are pure realism, and they're just not as compelling as its magical-realist fables set in the past. The Tiger's Wife comes with a strong pedigree. It's author, Téa Obreht, was named one of the New Yorker's 20 best American writers under 40, as well as one of the National Book Foundation's five writers under 35. This novel was excerpted in the New Yorker's fiction issue last year, and it's already getting tons of praise. And bits of the novel are, undoubtedly, brilliant. Especially the final third of the book, when it shifts more to the past and away from the present. It's just that we spend way too much time in the present, with a main character who never quite comes into her own as an interesting person in her own right. 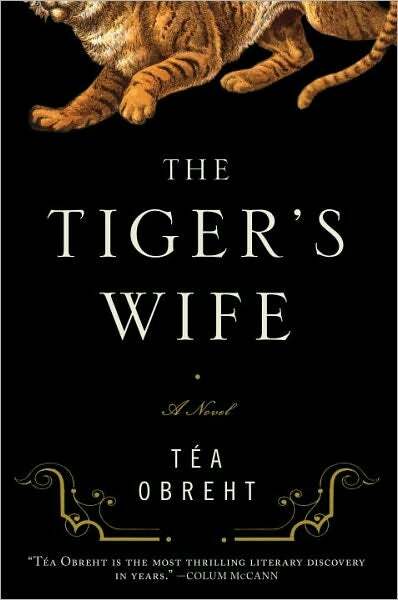 The Tiger's Wife, as the book jacket copy puts it, takes place in an "unnamed Balkan country" after an endless war. Natalia, a young doctor, is on her way to a small town to care for some orphans, and all around her are the signs of that war. But then she hears that her grandfather, also a doctor, has died of the cancer he'd been fighting in secret. She abandons her post to go searching for her grandfather's effects, and also delves into the secrets of her grandfather's past. We learn early on that her grandfather was obsessed with tigers, and used to take the young Natalia to the zoo every week to look at them. And through a series of flashbacks, we learn that a tiger came to live in her grandfather's village when he was a small boy. We delve into the story of the tiger and the young deaf-mute girl he befriended. We also learn about the girl's husband, a brutish butcher, plus the hunter who eventually arrived to fight the tiger, and the apothecary who tries (and fails) to protect the deaf-mute girl from the rest of the village. The villagers believe that the tiger has magical powers and is either becoming human, or turning the deaf-mute girl into a tiger herself. Meanwhile, we also learn about Natalia's grandfather's encounters with the Deathless Man, a figure out of fairy tales who's just what his name sounds like. The Deathless Man, it transpires, has pissed off his very powerful uncle, and as his punishment he cannot die. He travels around telling people whether they are going to die soon, and this gets him into a lot of trouble — the sort of trouble that even deathlessness can't always overcome. The grandfather and the Deathless Man, it transpires, formed a special sort of bond among the dying, especially the victims of war. The sad thing is, the stories of all of these characters in the past are fascinating, and full of life. They are fabulous, in the sense of feeling like they belong in fables. But when we spend time with Natalia in the present, which we do for most of the book's first half, it stays stuck in neutral. All of these characters in the past — all of them men, except the deaf-mute girl, who's viewed through male eyes and remains an enigma — are fascinating and passionate and have a real shape to their stories. But Natalia, herself, remains a complete cipher. She's stoic about the horrors she deals with as a doctor in the aftermath of war, and she feels sad about her grandfather, but she never seems to experience any great passions or epiphanies of her own. Natalia's only occasionally interesting in her relationship to her grandfather, who's portrayed as an obstinate, whimsical, clever man who secretly believes in the magic of tigers and the Deathless Man, even while he persists in pretending to be a strict rationalist. He's an old romantic, and whenever he pops up in the book, things get much more interesting. Since he dies early on in the story, we don't see that much of him, until the action shifts more towards the past. When your fight has purpose — to free you from something, to interfere on behalf of the innocent — it has a hope of finality. When the fight is about unraveling — when it is about your name, the places to which your blood is anchored, the attachment of your name to some landmark or event — there is nothing but hate, and the long, slow progression of people who feed on it and are fed it, meticulously, by the ones who came before them. Then the fight is endless, and comes in waves and waves, but always retains its capacity to surprise those who hope against it. We also see how much the people in the countryside cling to their superstitions, like digging up the heart of a dead person and leaving it for the mora to find. All in all, though, the book is a bit of a slog until you get about halfway or two-thirds of the way through, when an increasing amount of the narrative takes place in the past, in the land of magic and tradition and people who are already dead or dying in the present. The last third of the book, thank goodness, is almost entirely brilliant, as we unravel the stories of the various people whose lives intersected Natalia's grandfather's when he was younger. The stories of the people who touched Natalia's grandfather's life have a heft to them, a resplendence, that comes from the odd little details and mixing of cultures in the Balkans. These stories have seat-of-your-pants twists and turns, and interesting little revelations. Characters whom you thought were the villains of the piece become entirely more sympathetic when you delve into the disappointments and horrors that made them who they are. Young boys are fascinated with animals, but for Darisa the hysterical dream of the golden labyrinth, coupled with the silent sanctuary of the trophy room, amounted to a much simpler notion: solitude, and then at the end of it all, Death in thousands of forms, standing in that hall with frankness and clarity — Death had size and color and shape, texture and grace. There was something concrete to it. In that room, Death had come and gone, swept by, and left behind a mirage of life — it was possible, he realized, to find life in Death. This is obviously a huge theme in the book generally, as we come to grips with the death of Natalia's grandfather and with the omnipresence of death in everyone's lives — and the Deathless Man is a figure of death, whose punishment is that he cannot die but brings knowledge of death to others. At times, reading the fables that come to dominate the final third of The Tiger's Wife, I felt like I was reading a story by Peter S. Beagle, which is a high compliment in my book. There's also the fact that invoking magic and the supernatural lets Obreht be more fanciful and sets her free — the presence of the possibly mystical tiger and the Deathless Man gives the sections in the past a liveliness that's just not there in the present, where Natalia is dealing with mundane emergencies like children who won't get a checkup without a reward from a dwindling supply of candy. And then there's the role of history, which looms large in this novel — the two World Wars and the more recent ethnic warfare all blend into one horrible tapestry of war. But the sections in the past also give Obreht a chance to be more colorful, to include more larger-than-life avatars of history — which is one reason why people love historical fiction so much in general. But also, there's the inescapable fact that all of these flashbacks are about men, who live colorful, passionate lives totally unlike the narrator's. When there are women in these flashbacks, they're viewed through the male gaze, and frequently are just passive figures in the man's journey. After a while, you begin to suspect that Obrecht can only imagine great, sweeping stories as things that happen to men. Natalia, meanwhile, is just sort of a custodian of her grandfather's memory. All in all, The Tiger's Wife is a promising first novel, which turns brilliant in its final 100 pages or so. It definitely left me eager to see what Obreht writes next — and hopeful that she turns more towards sweeping stories of magical realism next time, without the need for a framing device.